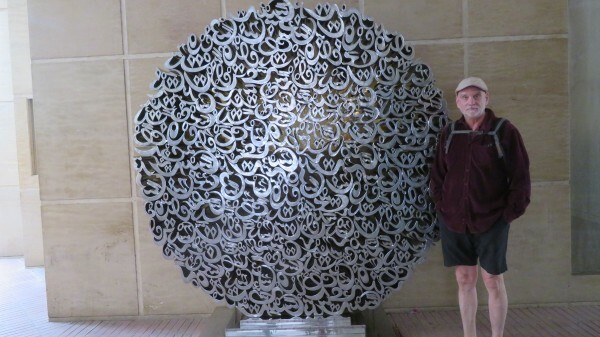 Morocco left me with eight main impressions. First, the contrasts in technology – delivery by donkey and by truck/motorcycle – and second, in cultures- modern dress next to traditional Berber next to conservative Islam. 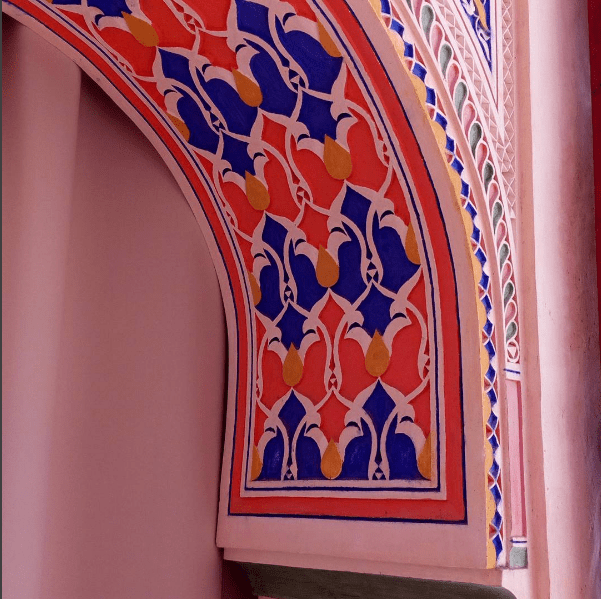 Third is the intricacy and extensiveness of the decorative architectural designs. Fourth is the daily prayer calls, a strange concoction of sound; perhaps more strangely is that people dis not seem to particularly notice. Fifth, the cuisine can reach impressive heights although it is mired in sameness on many levels. Sixth is the friendliness of the people we have met and the apparent tolerance. Seventh is the level of poverty and, finally, that its glory is largely in its past. 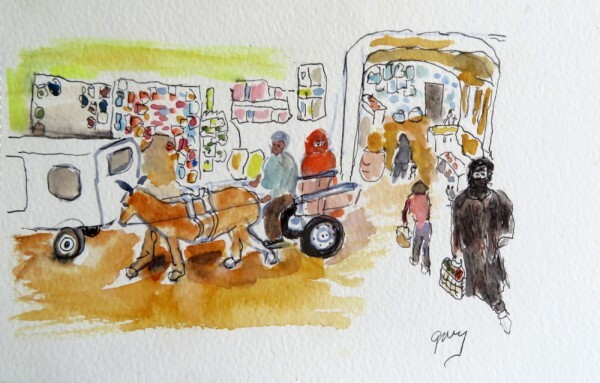 As we walked in the souks (markets) and even in modern areas we would encounter donkeys hauling delivery carts and the modern version, which is a motorcycle rig with an integrated covered bed. There are men pushing delivery carts in the narrowest parts of the souks, or men carrying bundles. Sometimes loads would be strapped to the backs of a donkey for delivery. In larger areas you see large modern trucks transporting goods. In the souks small stands are the norm, but in the modern areas you can see larger shops, super markets and international chains, some quite upscale. Women are everywhere, and dressed in everything from a full covering hijab, only eyes peering out from black robes making for a mysterious appearance both intriguing and chilling simultaneously, to jeans and blouse. The only women not very modestly dressed might have been foreigners. I saw few women working but there were some. The manager of the Orange shop we went into in Fez is run by a woman, and in the modern areas there women working in shops, cafes and restaurants. 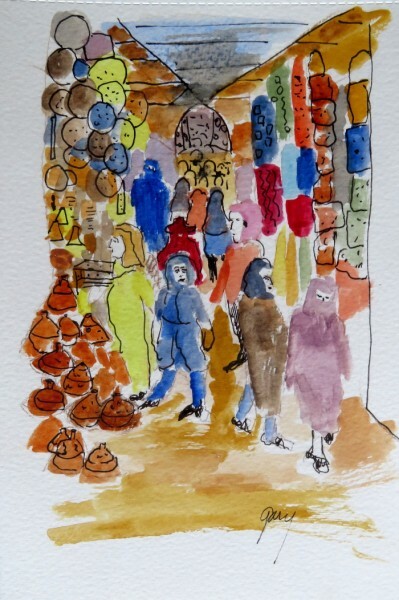 In the souks almost everyone in the stalls and shops is male. Here are some examples of the design features you find in old buildings. 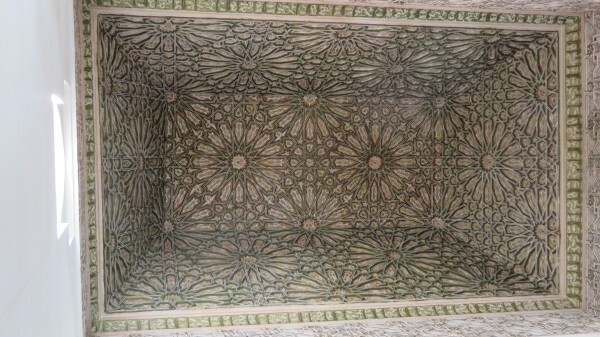 Islamic art is noted for this design, of which the Moroccan is a variation. 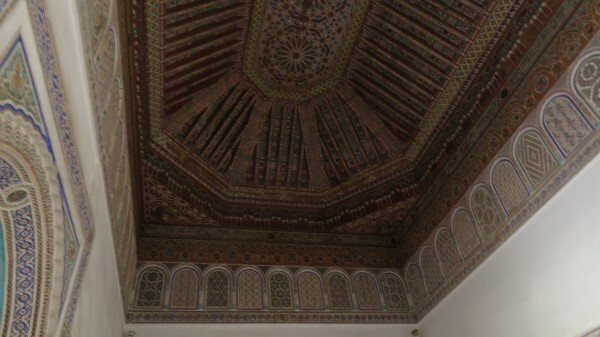 As you can see above, in some buildings the decoration is from floor to ceiling. No one seems to run to the mosque for all this praying. We could see groups of men in the mosques but not in large numbers. Both of the guides we employed talked about the religion. One explained the ritual washing you do before you go into a mosque and how it was not required to do your daily prayers in a mosque nor to assume the bowing posture unless you were in the mosque. But everything revolves around devotion to Allah. This is a religious country but not fundamentalist as a whole. Islam is pervasive but other religions are tolerated and the king is encouraging the re-immigration of Jews, many of whom left for Israel after a long and prosperous history here. Homosexuality is illegal but violations are sporadically enforced. Two girls photographed kissing were arrested but release without trial after an international outcry. One of our guides said the king does not want bad publicity and prefers to overlook things of this sort. Elton John was invited to perform at a festival celebrating spirituality and after some protests the king said he writes and sings about spirituality, his private life is his own affair. Alcohol is forbidden in Islam, but you can buy it here and they produce wine in the country. In our interactions we had in restaurants, shops, hotels and on the streets we found the people to be universally friendly. I saw one conflict with foreigners and that was a metal worker objecting to being photoed by a tourist. The military waved us off when we tried to photo a wall that turned out to be part of a military installation, but entirely understandable from their point of view. Many people talked to us as we walked around, and some have tried to get us to visit a shop to ‘just browse.’ Sometimes they help us find our way just being considerate. A 10 year old boy guided us out of our neighborhood that first day in Fez and insisted on being paid but several adult men wanted nothing for pointing the way. This is definitely a third world country so it is obvious that money is in short supply. There are many old taxis, for instance, with broken seats and no window cranks, although there are some brand new ones. The public buses are in decent condition- we have used several in Marrakesh. The population is young, with an average life span of 73, ranking 80th in the world. Dental care is rare, judging by their teeth. The food is plentiful and of excellent quality, fruits and vegetables are part of the daily cuisine. They must not be coming from far away. The cuisine is tasty and reasonably varied. Alcohol is in short supply and expensive where available. There are huge vineyards near Meknes. The Moors who invaded Spain in 711. The name ‘Moors’ comes from the Berber tribe called the Mauri (do not confused with the country of Mauritnia). 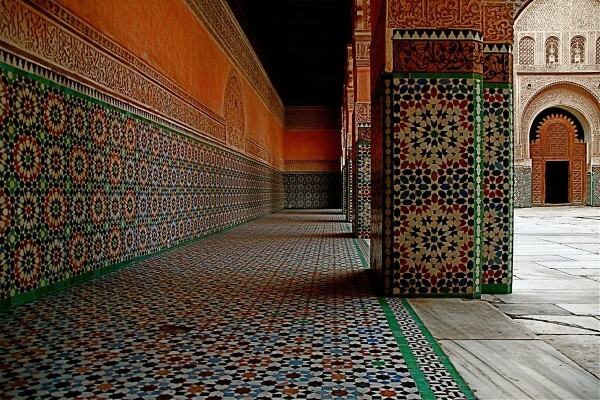 At that time the Islamic culture was a main source of knowledge for the Mediterranean countries and Europe. Medicine, astronomy agriculture and more were absorbed into European culture as a result of the take over of Spain. It is this of which they are perhaps most proud, but now the main product of these cultures is Islam, in which they seem to place a great deal of hope. Both of our guides witnessed their faith to us, and probably presumed we are Christians. At least we all have the same God, said one. The other suggested that there would be no modern medicine if it weren’t for the Moors and Arabic culture in general. There is something to be said for this, but on the other hand, what have they done since? 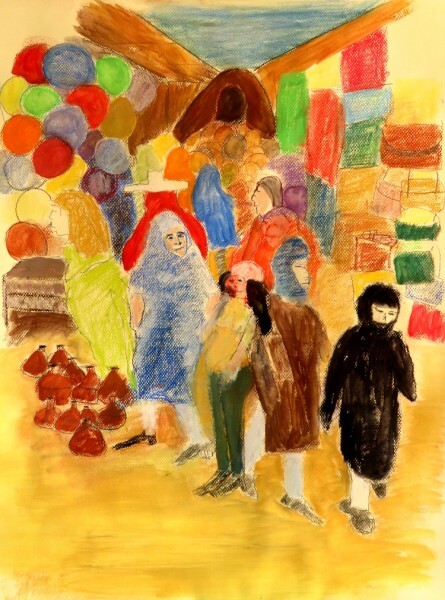 Their ancient markets are a huge attraction. 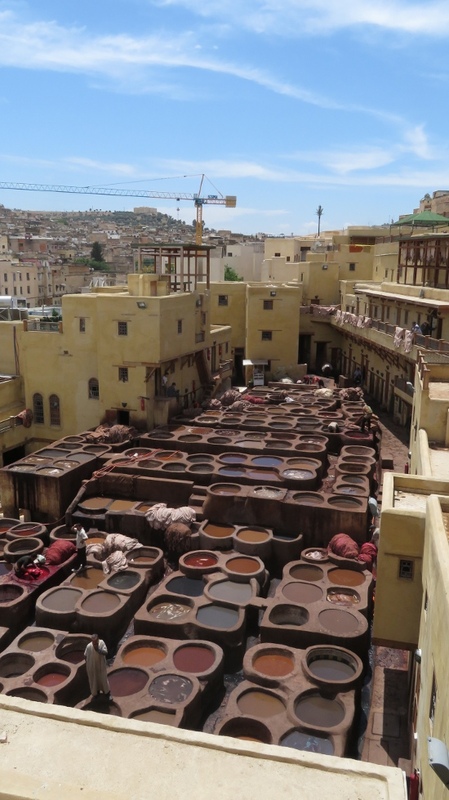 Leather production is still done in the same way and at least in Fez in the same location since the 14th century. They use natural dyes only in the craft markets, and are prohibited from selling anything other than traditionally made items. In the leather area they still use pigeon droppings and other traditional processes to treat camel, cow, goat and sheep skins. Goat is the best, we were told, as it produces the softest and most water resistant product. 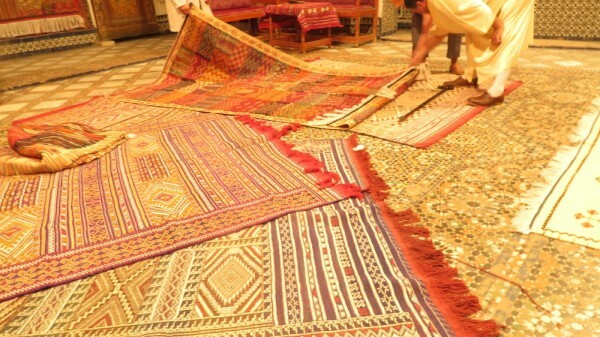 Carpets and scarves are made from traditional materials in the traditional method, using hand looms. We bought some scarves made of agave, the cactus, that you would swear was silk. They preserve their past. What of their economic future? Loved the amount of specific details in your blogpost, and the way you illustrated it with art you had made (in addition to the photos). My own very short trip to Morocco (way back in 1983) was very unpleasant (went in the winter, so the hordes of coercive teenage “guides” – or would-be guides – were probably more aggressive due to the scarcity of tourists. We (me and Harvey) were on absurdly frugal budget, so we stayed in a horrible “hotel,” with zero hot water. Thing got better only when we hired a guide to ward off the constant other potential “guides.” The food, though, I remember as good (it probably helped to have been starving, freezing, etc.!) Your account of Morocco makes me want to give it another try if I’m ever in the area again. Probably a lot has changed since 1983. Hardly anyone gave us a second look and there was very little aggressive selling. Most annoying moment came in the main plaza in the Marrakesh medina when we walked past the evening only eateries. Each of them sent out someone and they were so in your face you could not see what was on offer. Very interesting and well described.